Often, finding that perfect pair of smart trousers can feel like an impossible task. Searching for a pair that are appropriate for work – yet stylish enough for play, can seem like looking for a needle in a haystack. But look no more – as Karen Millen appear to have the solution to your problem. The high-end, high-street brand have a pair of stunning black trousers that are so popular, they sell out time and time again. 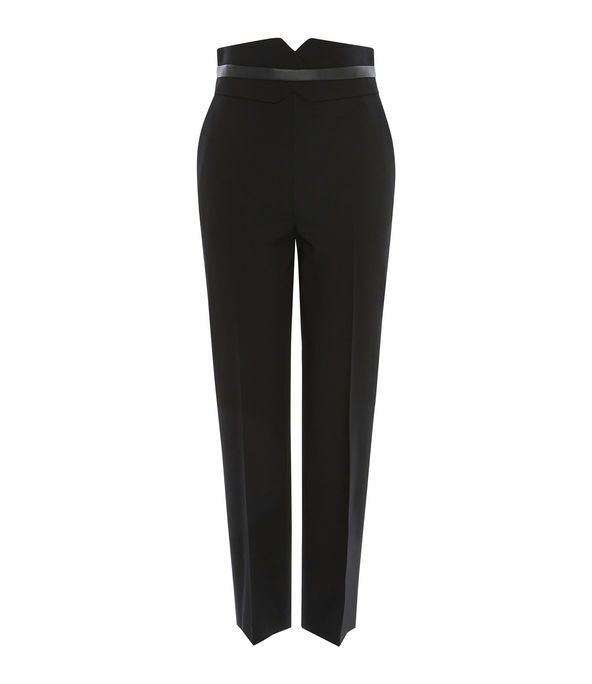 Made in a chic cigarette style design, the high-waisted ‘Forever Trousers’ are both fashionable and practical. The simple but elegant design guarantees the perfect outfit for work – while the daring, high-waist belt detail make sure the trousers look stylish even when you’re out of office. They’re also super-flattering – cinching you in at the waist and elongating your legs with the cut-off, cigarette style. In fact, the item looks suspiciously similar to something you may find in the wardrobe of the Duchess of Sussex. Meghan regularly wears tailored, fitted black trousers – and these Karen Millen ones are a perfect copy of her most recent pair. Karen Millen’s popular trousers could be worn with almost anything too, making them the perfect wardrobe staple. Pair yours with a chic, simple top or a chunky, knit jumper – the tailored trousers will ensure you look smart no matter what. They’d also pair perfectly with some heels or flats, depending on what you’re up to that day. @Rochellehumes got there first. Snap up our #ForeverTrousers before they sell out (again). And while the Forever Trouser is one of the brand’s bestsellers, happily, they are now back in stock! Available in sizes 6 – 16 online, the trousers are slightly more expensive, at £125. But, given that they’ll match with almost anything you own already, we reckon they’re the perfect investment item for your wardrobe.